I’ve been thinking a lot about testimony, and how blessed I am to have one, and perhaps how blessed I am that it even happened. To be honest, I’m not quite sure how I knew, at first, that God was there and he was listening to me. There are parts of my testimony that I remember quite vividly when those came, but I can’t remember a time when I didn’t know that I could talk to God and he would answer. 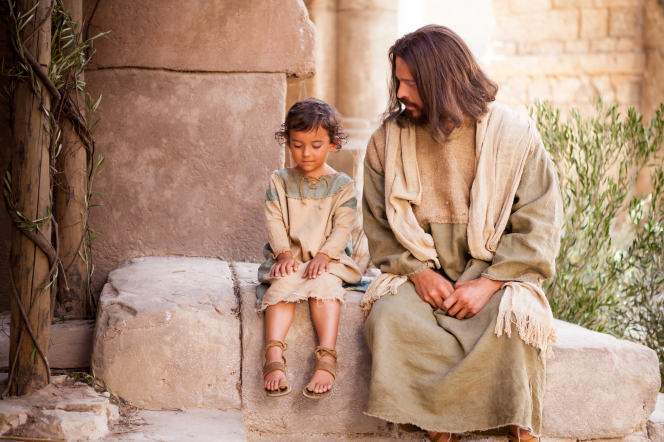 Even as a very young child, before I ever stepped inside a church, I remember talking to Heavenly Father. That’s not to say my faith has never wavered, and I haven’t wondered from time to time if God was listening. But back to the beginning. I was born to a father that was raised in the church, but who had become quite inactive and to a convert mother. She was baptized while she was pregnant with me. My parents were teenagers when they married, and at best had a tumultuous relationship, but when I was five, through the prayers and help of my grandparents, their hearts were softened for a time, and they returned to church activity. I still remember going to church for the first time and the warm feeling that encompassed me. In primary, we sang about being a child of God and families being together forever. My teachers taught me about the temple. I’m sure those teachers have no idea how much they impacted that young girl who had never heard of forever families or temples, but they planted a seed in my heart. So much so, before long I was begging my parents to take us to the temple. In my little five-year-old heart, I knew what they were teaching me was true. To my surprise and delight, my parents agreed with me and they worked toward that goal. When I was six, we made the drive from Denver to Manti. Back then, the Denver Temple was several years away from being built. I rode with my grandparents most of the way, and we talked and sang on the CB radio with my parents and siblings in their car–I know I’m dating myself there. It is one of my happiest childhood memories. But nothing was more precious to me than the next day, when we were all dressed in white and kneeling around the altar. That seed that had been planted swelled into a true knowledge. I will never forget the Spirit that was felt in that room. I wished I could say that from that time forward my family continued on in church activity, but I can’t. A year later my parents fell away for several years. But again a seed had been planted and it bloomed. At such a young and tender age, my testimony was simple, and it didn’t encompass all things, like knowing the Book of Mormon was true or even if Joseph Smith was a prophet, but it was enough to carry me through the next several difficult years of being without the gospel. And it was enough for me to insist that I be baptized by my grandfather, even against my parents’ wishes. Eventually, as a teenager, my family returned to activity and more pieces of my testimony started to fall in place and grow. I came to know for myself that the Book of Mormon was true, we have living prophets, and indeed Joseph Smith was a prophet of God. But over the years, I’ve learned that gaining a testimony isn’t a one-time thing. It is the culmination of several different events and the process of daily scripture study and prayer. It is fragile, and there have been times when it has faltered. There are still things I don’t understand, and sometimes that makes me question the whole of my testimony. But I like what our current mission president said in a recent stake conference. He said he likes to think of the gospel in terms of balloons. He has ten thousand balloons that he knows are all true, but over to the side, he has five or six balloons he isn’t too sure about, like polygamy. He says once in a while he’ll take one of those balloons off the shelf and examine it. He’ll ponder over and study it, and then he puts it back on the shelf. He doesn’t let what he doesn’t know yet affect the ten thousand things he does know. 1. Do as President Uchtdorf counsels – Doubt your doubts. 2. Ponder your questions and concerns in your heart and mind. Talk to a trusted friend, family member, visiting or home teacher, or even your bishop. It’s okay to have questions and doubts. In fact, it’s a good thing. 3. Take them to the Lord. Seek for answers through daily scripture study and prayer. 4. Attend the temple as often as you can. Meditate there. 5. Don’t turn to social media to air your doubts and grievances. Again, it is good and natural to have questions. The Lord wants us to know for ourselves. He does not want blind followers. But remember what is put out on social media is there to stay. 6. Take time to breathe. Sometimes when we learn of something our natural man doesn’t automatically agree with or understand, it is important that we let our knee-jerk reactions settle. This is where social media comes into play again. Remember, not everything you read online is true. Go to the source. And then again, take it to the Lord. Study it out in your heart and in your mind. 7. Don’t take offense. I know, easier said than done. But why would you give someone that power? 8. Last but not least, don’t let the few things you are unsure of keep you from the blessings of the ten thousand things you do know are true. Remember the joy the gospel has brought you. If you are struggling with your testimony, please remember you’re not alone. Heavenly Father stands ready to help. All we have to do is reach out. His arms is stretched out still. He will carry you upon his shoulders if needs be. Just don’t give up. I love your testimony, Jennifer. Thanks for sharing. I love the 10,000 blaloons analogy. This gospel is so amazing and brings me so much joy. I agree that we should not let those 5-6 doubting balloons make us release our hold on the 10,000 balloons we know are true and right.